After the success of â€œPrologueâ€, held in April this year by 6 young final year art students from UiTM Shah Alam, you could say that this exhibition is the awaited sequel. â€œCarbonâ€ features 5 of the 6 artists from the exhibition in April, who are joined by two new members, all seven of whom now make up the current permutation of the Intuitive Art Group. This time around, 23 art works from this group of talented young artists are showcased. Four out of the seven artists are recent graduates from UiTM Shah Alam. The youngest member of the group is also this yearâ€™s co-Grand Prize Winner of Nandoâ€™s Peri-fy Your Art annual competition, 22-year old Nik Mohd Shazmie. Carbon began on Thursday, October 31, and continues its run until November 19, 2013. 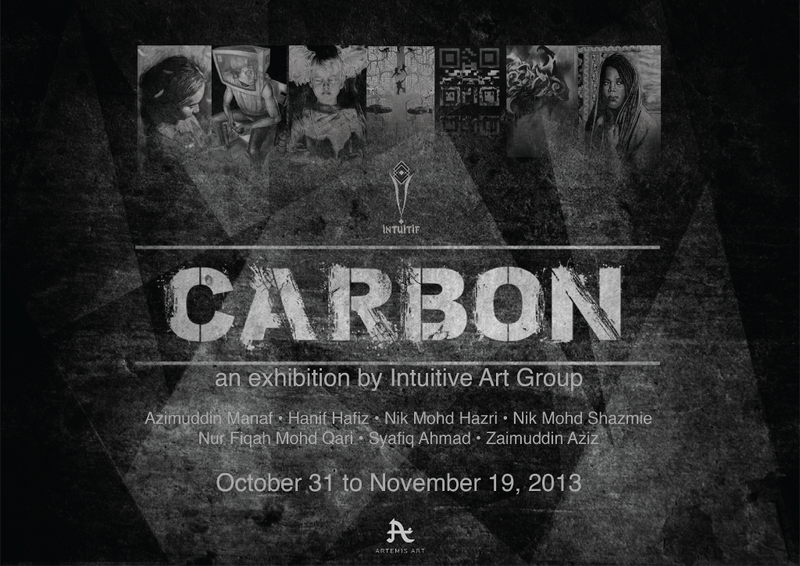 The official opening for Carbon will be atÂ 8pmÂ onÂ Tuesday,Â November 12,Â 2013. We are delighted to announce thatÂ AmbassadorÂ Dato’ N. Parameswaran, a name that needs no introduction to the Malaysian art scene, has graciously agreed to be our guest of honor. â€œCarbonâ€ is a themed exhibition, centered on the use of carbon-based art media, such as charcoal, graphite, pencil and soot. Some of the artists have expanded the definition of what constitutes being carbon-based, producing as a whole a fairly diverse collection of works, from a medium standpoint, as well as stylistically. But â€œCarbonâ€ isn’t just about the media used. As a basic building block of all living matter, carbon to the Intuitive Art Group is also symbolic of â€˜going back to basicsâ€™. The group, having spent the last few years concentrating on painting, decided that this was a good time to go back to a more basic form of art â€“ drawing. The groupâ€™s artistic skills and maturity are evident in the works. Yet, within that maturity one can still get a sense of innocent naivetÃ©, perhaps a reflection of the young age these artists are at. This combination, however, is what we think gives the body of work a fresh, bold feel. We congratulate the Intuitive Art Group and wish them continued success with their artistic endeavors. Looking at the superb works they have put together for â€œCarbonâ€, there is little doubt that there will be many more quality sequels to come in the years ahead.